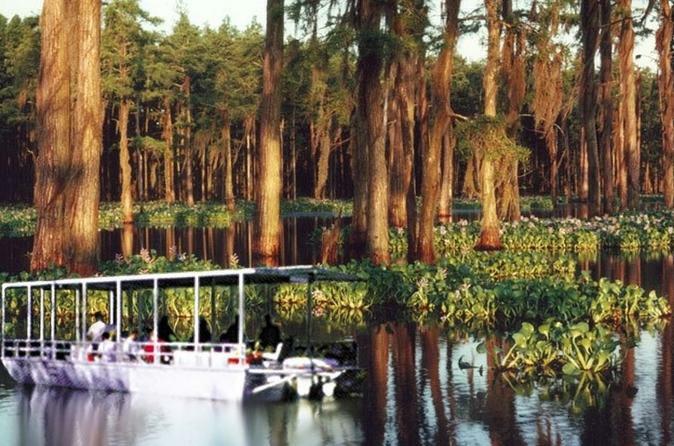 Experience Oak Alley Plantation, Laura Plantation, lunch at a Cajun restaurant, and a swamp tour in the same day on this full day tour Combo tour. Your guide is also the driver and will be narrating all of the destinations that you and your group will visit. The 9-hour tour starts with pickup from your New Orleans hotel and includes lunch at a Cajun restaurant. Combination Tour: experience Oak Alley Plantation, Laura Plantation, lunch at a Cajun restaurant, and a swamp tour in the same day. Enjoy a narrated journey through scenic cypress swamp and wetlands to a magical place where time has stood still, the Old River Road. Learn of a land of the Creole, plantations, slaves and slave revolts. View plantations Evergreen, Columbia, Whitney, Laura, Felicity and Saint Joseph. Experience the slow place of the Old South, Majestic Oak Alley Plantation. Tour its antebellum mansion for approximately 1 hour 40 minutes. Sip a mint julep, visit the gift shop, or take pictures on historic grounds. Then tour charming Laura Plantation and her memoirs. Explore the rigors of 200 years of daily life, along with the sobering experience of slavery as it happened on this sugarcane Plantation. After 1 hour 40 minutes at Laura, enjoy lunch at a Cajun restaurant. Then experience a 1 hour 45 minute swamp tour after your visit to the plantations. Tour leaves at 8am and returns at 5pm. Pick up starts 30 minutes before departure depending on your hotel location.